Thursday April 17th 1902 Will went up in the country with Fred [Miller?] to see about buying some stock. Will bought three cows two of them have young calves. I sewed most of the day and finished my calico dress. Friday April 18th 1902 I had churning and baking to do in the forenoon and swept all the lower story and two rooms up stairs. In the afternoon I cleaned the garrett. Bob was here to put in the pump and make some shutters for the west windows. Will went after his stock in the morning and to town in the afternoon. Mollie went home tonithg. a windy afternoon. Saturday April 19th 1902 I was busy with the work most all forenoon. Will washed the surry. Charlie McCallister was here to dinner. We went to town in the afternoon. I selected a buggy at Carsons and Will traded the surry for it and gave $35.00 besides. I went to see about work on my teeth. I was busy in town all afternoon. 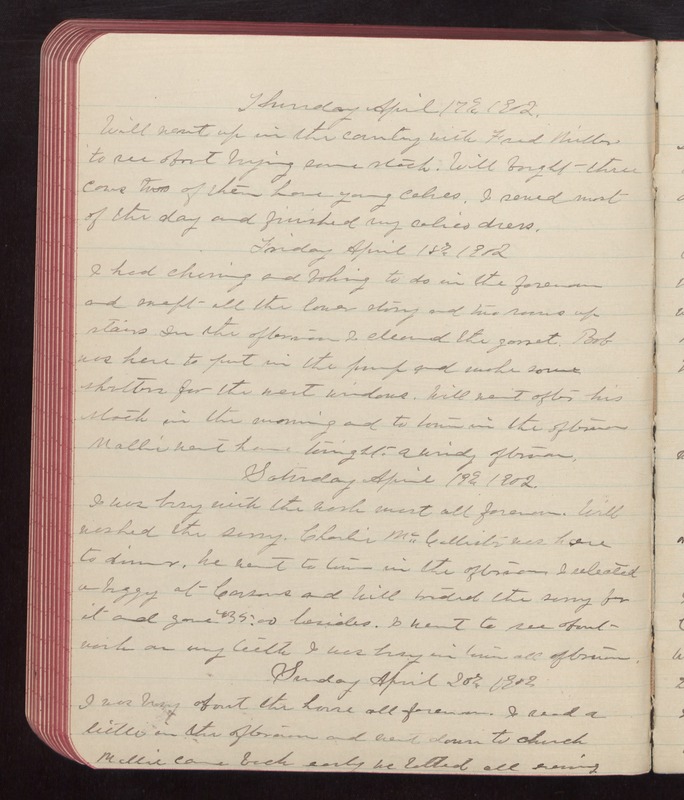 Sunday April 20th 1902 I was busy about the house all forenoon. I read a little in the afternoon and went down to church. Mollie came back early. we talked all evening.